The owners of a famous Frank Lloyd Wright home in California are sick and tired of architecture aficionados walking up to their property to glimpse the beauty within. But, with the right bottle of wine, the Millard House’s residents may let curious visitors have a look around. Wright built the Millard House (or La Miniatura) for George and Alice Millard in 1924. The structure was Wright’s first attempt at modular building, but the house is far from ordinary. Its signature concrete facade and courtyard walls are covered in a textile pattern, which helps it blend into the steep but lush site. 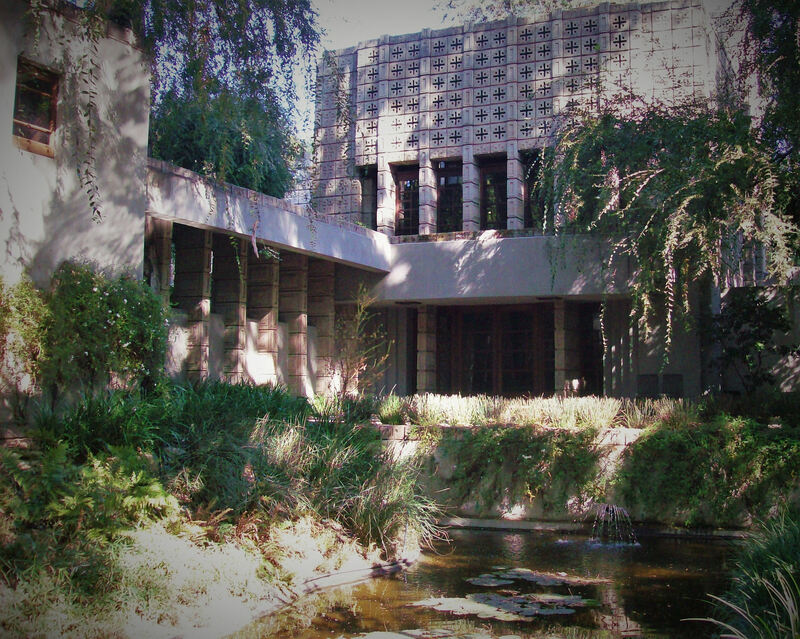 The Pasadena home, one of five concrete block abodes the architect designed in southern California, was added to the National Register of Historic Places in 1976. In addition to its beauty, La Miniatura exemplifies a turning point in Wright’s practice as he expanded beyond the Prairie Style for which he had become known. Naturally, people are all about Wright and his work, and in the past, it was possible to wander up to the property, undisturbed. 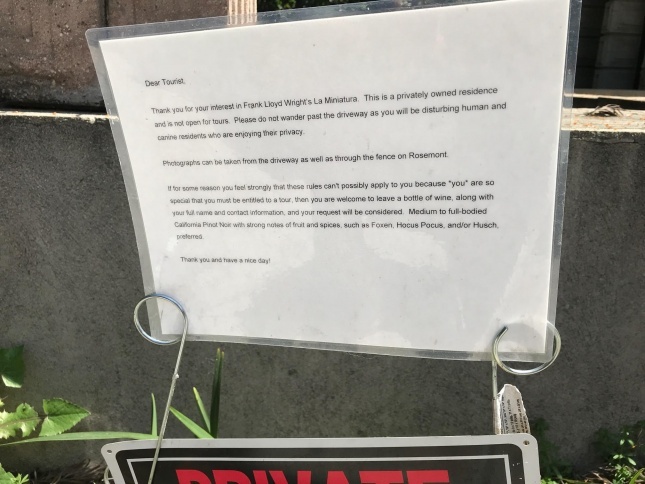 Last week, though, reader Ken Saylor sent The Architect’s Newspaper (AN) a picture of a note outside La Miniatura taken by his sister, Michelle, on a recent visit. If for some reason you feel strongly that these rules can’t possibly apply to you because *you* are so special that you must be entitled to a tour, then you are welcome to leave a bottle of wine, along with your full name and contact information, and your request will be considered. Medium to full-bodied California Pinot Noir with strong notes of fruit and spices, such as Foxen, Hocus Pocus, and/or Husch, preferred. A “Private Property” sign appears to be hung just below the note, for good measure. AN reached out to the Los Angeles County Assessor’s Office to learn the identity of the oenophile owners. (The county doesn’t list owners in its online property database.) While the owners request full transparency on behalf of potential visitors, they’ve chosen to hide their identities behind a LLC. Records show the home is owned Acme Int Capital Mgmt, which is registered to an address in nearby San Marino, California. The property has changed hands three times in the past decade. It last sold in 2015 for $3.65 million. Efforts to contact the owners were unsuccessful.